A-'paw'-logies, this item is out of stock. We will notify you when it becomes available. Alternatively, you can add it to your cart, and we will ship it to you the moment it arrives. Note: You will not be charged until the item is shipped out to you. Effitix acts as a generic Frontline® to offer dogs fast, long-lasting and highly effective protection against fleas, ticks, mosquitoes, lice and mites. Effitix combines the pest killing action of fipronil, the active ingredient in Frontline Top Spot and Frontline Plus, with the pest resistance of permethrin to offer lasting protection from a wide variety of pests. 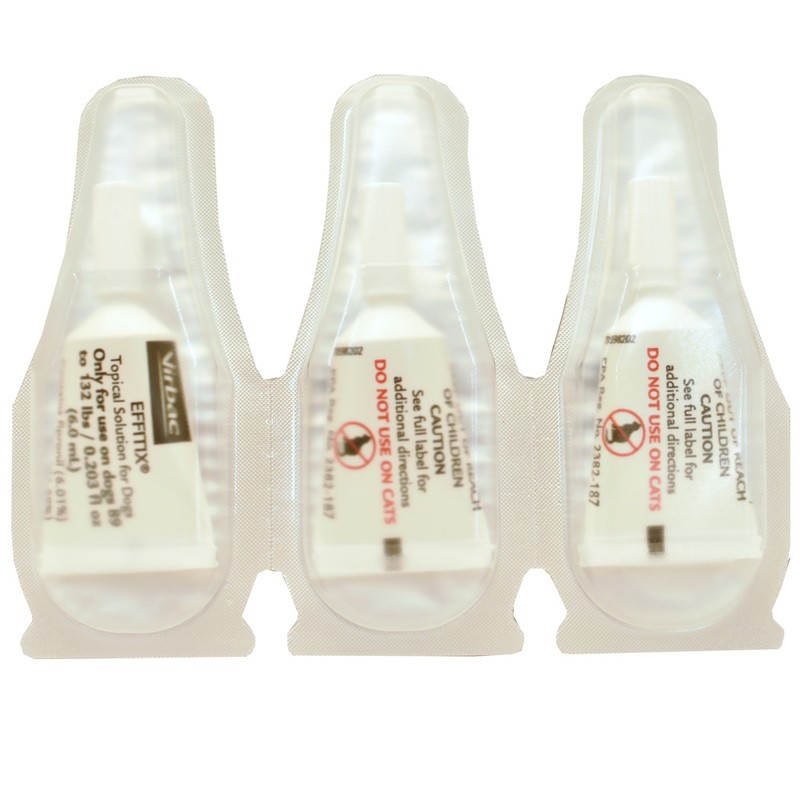 Effitix effectively kills and repels 4 types of ticks with Effitix: the Brown dog tick, American dog tick, Lone Star tick, and Deer tick. By controlling pests, your pet is also protected from potentially receiving commonly transmitted diseases such as: bartonellosis, tapeworm infestations and Lyme disease. Effitix for Dogs is fast acting and starts repelling pests as quickly as 10 minutes after initial application. Pets are then continually protected from pests for up to 30 days with a single treatment. Effitix is also waterproof, ensuring your pet stays protected no matter their day to day activity. 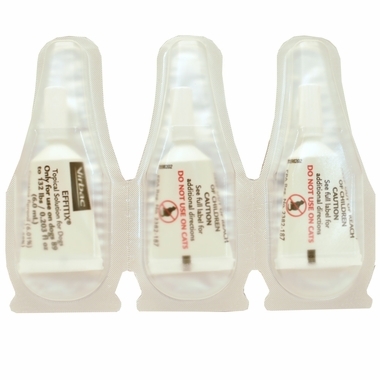 The convenient applicator makes treatment simple and comfortable for your dog. 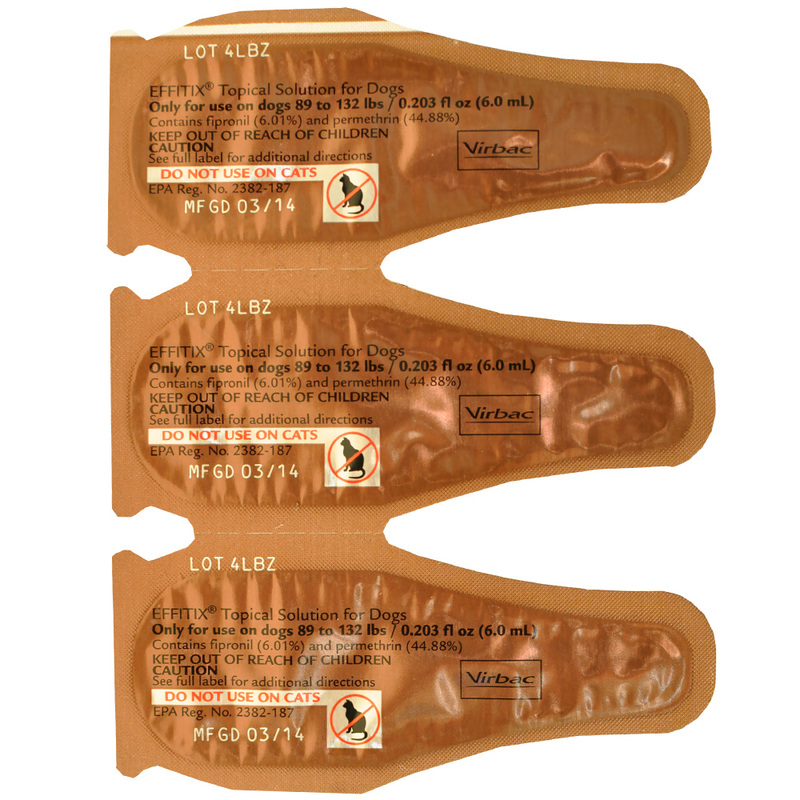 Remove one applicator from packaging. 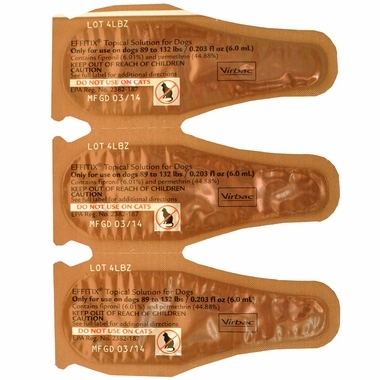 Hold applicator upright and remove cap. Invert cap and place other end back onto applicator tip. Push cap down to break seal. Remove cap prior to treatment application. Part dog’s hair until skin is visible. Place applicator tip directly against exposed skin. For small dogs and puppies 8 weeks old or older weighing 5 to 10.9 lbs or weighing 11 to 22.9 lbs: Deposit entire contents by squeezing the entire applicator contents onto dog’s skin, at a single site, between the shoulder blades. For medium dogs 23 to 44.9 lbs or large dogs 45 to 88.9 lbs: Apply the product evenly to three spots on the dog’s back, starting between the shoulder blades and continuing on to the second and third spots, squeezing the applicator until empty. For extra large dogs 89 to 132 lbs: Apply the product evenly to four spots on the dog’s back, starting between the shoulder blades and continuing on to the second, third, and fourth spots, squeezing the applicator until empty. 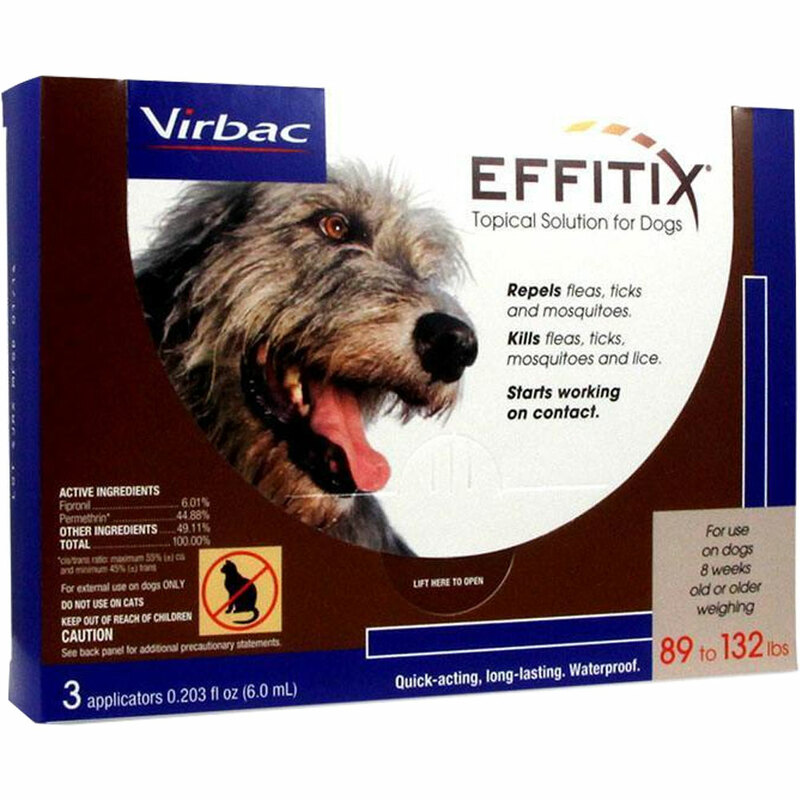 Ensure that EFFITIX Topical Solution for Dogs is not applied superficially on dog’s hair. Call a poison control center or doctor immediately for treatment advice. Have person sip a glass of water if able to swallow. Do not induce vomiting unless told to do so by a poison control center or doctor. Do not give anything to an unconscious person. Hold eye open and rinse slowly and gently with water for 15-20 minutes. Remove contact lenses, If present, after the first 5 minutes, then continue rinsing eye. Call a poison control center or doctor for treatment advice. Rinse skin immediately with plenty of water for 15-20 minutes. Harmful if swallowed. Causes eye irritation. Avoid contact with skin, eyes, or clothing. Wash hands thoroughly with soap and water after handling and before eating, drinking, chewing gum, using tobacco, or using the toilet. Do not use on dogs under 12 weeks of age. Individual sensitivities, while rare, may occur after using ANY pesticide product. Dogs may experience some temporary irritation at the site of product application. If signs of sensitivity occur, bathe your pet wiht mild soap or shampoo and rinse with large amounts of water. If signs of sensitivity occur and persist, contact a veterinarian immediately. If your dog has an unusual reaction to the initial application, consult a veterinarian before repeating application. Certain medications can interact with pesticides. Consult a veterinarian before using on medicated, debilitated, aged, pregnant or nursing dogs, or animals known to be sensitive to pesticide products. STORAGE AND DISPOSAL: Do not contaminate water, food, or feed by storage and disposal. STORAGE: Store unused product in original container only, out of reach of children and animals. IF EMPTY Nonrefillable. Do not reuse or refill this container. Offer for recycling, if available. IF PARTIALLY FILLED: Call your local solid waste agency for disposal instructions. Never place unused product down any indoor or outdoor drain.